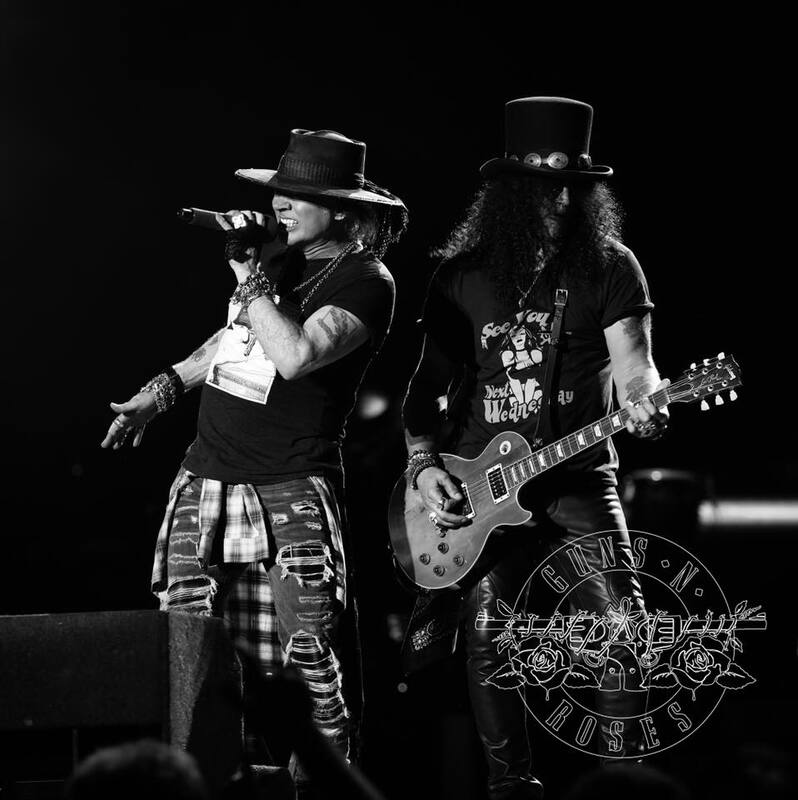 As the Guns N’ Roses reunion tour heads into its third year, Slash is sharing the story of his first contact with former bandmate Axl Rose in 2015 after nearly two decades apart. “It was on the phone, and then we got together when I got back into town,” Slash tells Nikki Sixx on his Sixx Sense radio show (video below). “I was on the road; I was in Peru. I remember it specifically. It was very cathartic to physically talk. ‘Cause there’s a bond that you have that’s never [broken], and then what happens is the bond makes the negative side of that much worse, because you’re forced out of it. Slash, Rose and Duff McKagan launched the Not In This Lifetime tour with a rare club show at The Troubadour in Los Angeles on April 1, 2016; the event saw Rose break his foot early in the performance, requiring surgery and the use of a throne – on loan from head Foo Fighter Dave Grohl – for live shows until the injury healed. Slash said the Troubadour gig felt “very surreal” when he looked across the stage and saw Rose, adding, “And it just snowballed from there. So it’s been 18 months … if you had talked to me 20 months ago, I would have said, 'No f---ing way. It’s never gonna happen.’ But it did, and it was f---ing awesome. The reunion run recently delivered Guns N’ Roses the No. 2 spot on live music industry magazine Pollstar’s list of worldwide concert tours in 2017, with 2.68 million tickets sold over 81 dates for a gross of $292.5 million; since its 2016 launch, the trek has made almost $500 million. The group will reconvene for a series of summer 2018 concert dates across Europe that will begin in Berlin, Germany on June 3.